Set in Japan just after WW2 Joe Butterfly is about a kind of Police Academy style group of ill disciplined ne’er-do-wells tasked with putting together celebratory edition of their Army magazine to commemorate VJ Day. There’s even a Lieutenant Harris figure with exactly the same pompously overreaching characteristics as the one in the Police Academy films. After being stationed in the bunkhouse (as a sadistic punishment) the men decide they need to find a new office where they can firstly hear themselves think and secondly have room to spread out, so they can write and put together the magazine at incredibly short notice. This post-War Japan is curiously welcoming of the forces now stationed there – cheerfully accepting the military occupation in a way that begs further explanation, but which goes unsaid. It’s here into this welcoming community that the men of the magazine come into contact with Joe Butterfly, the titular fix-it man who is trying to make good in the post-War world. Joe Butterfly as a character is a big, big problem – not because of the fix-it and money making activities he indulges in, but because he’s Japanese and being played as a caricature by a Caucasian actor. 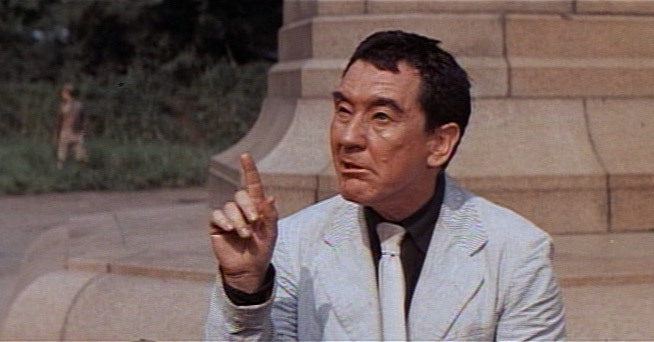 Burgess Meredith was a talented chap – he was best known for playing the trainer in Rocky and for his role defining turn as The Penguin in the Adam West Batman TV series – but here he’s… well he’s doing a “comedy oriental” character which is just painful to watch. And it seriously begs asking, why have a Caucasian actor playing Japanese in not very convincing make-up when the rest of the Japanese characters in the film are played by Japanese actors. Surely on set that must have been horrendous. As an overall film what starts promisingly, with some daft cross-talk comedy banter between enlisted men and their superiors, quickly grinds to a halt. There are occasional chuckles but they are few and far between. The movie sets up a huge amount of comedy scenarios which either aren’t followed through or which are creaked slowly and languorously through to their inevitable conclusion. This is the kind of comedy film which unironically uses music more suited to Tom and Jerry cartoons to reinforce events. And there’s something that most comedy films don’t need, and that’s jaunty music to let you know how funny it is. Joe Butterfly just isn’t very funny. What it is though is incredibly slow – the pace never living up to the jaunty promise – which makes watching it a chore. Also the film is shot in Cinemascope but presented in a letter-boxed version in 4:3. Consequently the image appears to be sitting in a tiny box in the centre of the screen. Which is a little odd. Joe Butterfly is out on DVD now, but we’d give it a miss.